Thanks to Dine' Water Rights for sharing the vote! 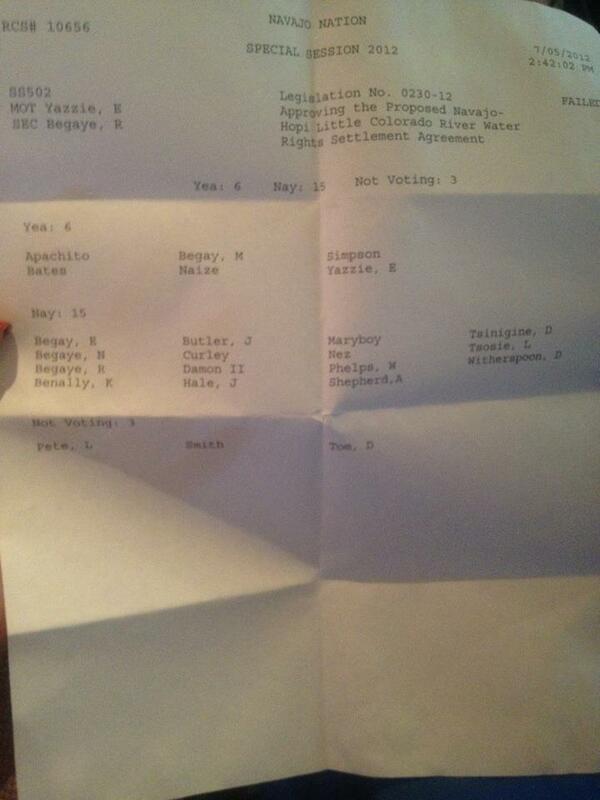 The vote was 15 against, six in favor, and three abstentions! WINDOW ROCK, Ariz. -- The Navajo Nation Council voted down the Navajo-Hopi Little Colorado River Settlement Agreement on Thursday afternoon. The vote was 15 opposed, six in favor, and three abstentions. Navajos opposed to the settlement say it is a scheme devised by Arizona senators, corrupt politicians and non-Indian attorneys to steal Navajo water rights for the Navajo Generating Station, one of the dirtiest coal-fired power plants in the US, and for non-Indians in Arizona to continue their lavish lifestyles. Navajo Council Delegate Katherine Benally said, "I am speaking for the future generations. I have heard you my dear people. This settlement is the Genocide of our nation, and as a leader I will not allow that. As a women, I pray to water, I sit behind water and pray for it. I praise the efforts of my people and I ask you to support me, support us leaders as we move on. Let's take this negative document and make it a positive one. One that will rejuvenate our people." Reporting from the council chambers, Dine' Water Rights said so far today, most council delegates have opposed the scheme. The scheme has been promoted by Arizona Senators Jon Kyl and John McCain, along with the Navajo Nation's non-Indian water rights attorney. The settlement would sever Navajos expansive water rights under the Winter's Doctrine. Council Delegate Benally told the council, "We must protect what is rightfully ours. Peabody's greed and disrespect to our water and our resources needs to stop." She is the Navajo council delegate for Chilchinbeto, Dennehotso and Kayenta, Ariz., in the region where Peabody Coal mines Black Mesa. The coal is used for the Navajo Generating Station near Page. 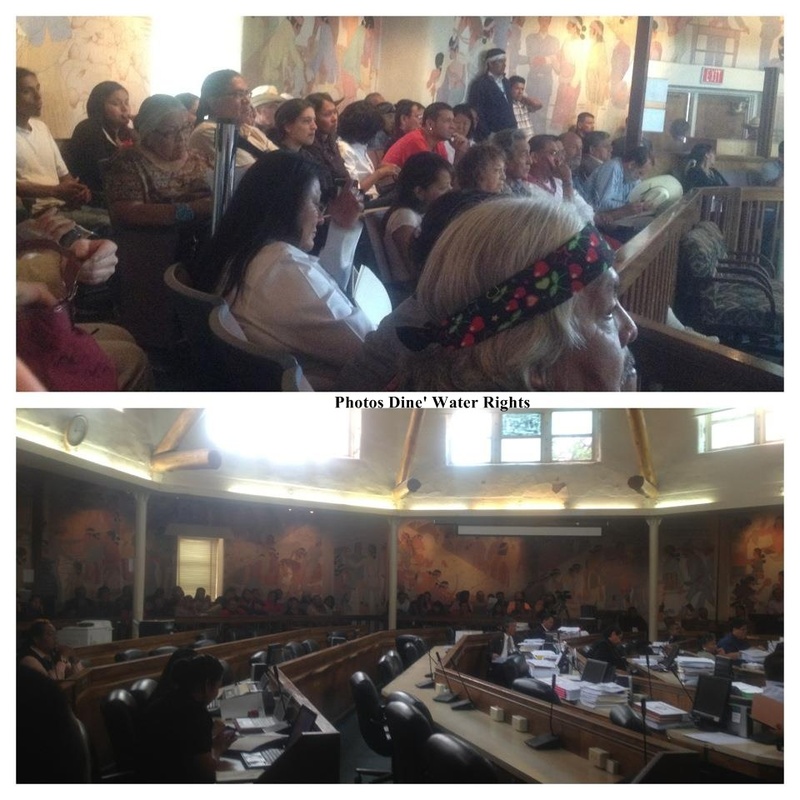 Benally told the council that Navajo communities have been misinformed about the settlement. Benally said only ten farms are listed in the settlement. Further, she said the Western Agency Council has unanimously voted this settlement down. "We can not trust Kyl! He was an attorney for APS! He won on their behalf and cheated native people." "Tribal nations across this nation are looking at us they are looking to us to see if we will kneel down and bow to the federal government. Let us not only let our people down but all indigenous people across the united states," Benally said, as reported by Dine' Water Rights in the council chambers today, Thursday, July 5, 2012. The Navajo Council voted in favor of separate legislation further opposing the scheme. The council voted 15 to 1, with eight abstentions, in favor of legislation sponsored by Councilwoman Benally. In this legislation, the council voted opposition to the Navajo-Hopi Little Colorado River Settlement Agreement and the lease extension for the Navajo Generating Station, as stated in US Senate Bill 2109. While many Navajos live without running water and electricity, they live with the pollution and disease from coal mining and coal fired power plants, along with oil and gas wells and unreclaimed uranium mining from the Cold War. Besides the disease and pollution, the land on Black Mesa has been devastated from coal mining, and already the water has been depleted in the springs and aquifer, in order for Peabody Coal and the Navajo Generating Station to produce electricity that flows away from Navajoland to cities in the Southwest. I think that Navajo nation should get rid of the government all together put so kind of different form of government. I hear that the president and some the navajo ranger are go to change the dine people for live on there own land and taking the live stock away little by little up till there is none. So I think we should just sell the land back to the US government 100 times as much for what it's worth and pay every Navajo 4000 dollar every month up to 50 year. Get free school till every Navajo that wanted to go to college is all paid off. The US government will ripe the dine people of all the right that is they have now little by little every year. You don't know it the government is buying the president and other top officials. They are build casino on reservation think that it will bring in money but it not. Most people that go there will the native people, you all think we own the casino but we don't it other big cooperation own not the nation. So that is it for now.